The term originated in Philadelphia, where it was used to describe the heavy traffic of people and vehicles that filled the streets the day after Thanksgiving. Later, an alternative explanation emerged, referring to the term ‘black’ accounts of the trade, moving from red ink to black thanks to the surplus. It is the largest shopping phenomenon since 2005. 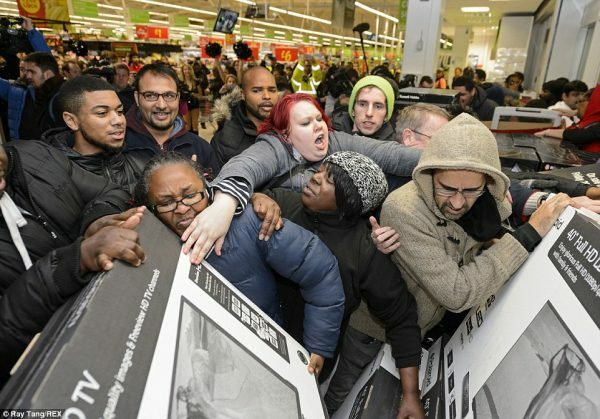 For a few years now, thanks to the vastly used social media, Black Friday is a subject of violence, outbreaks, riots and fist fights but for some, including me, some of these events and videos are very entertaining and funny. This was the most fun I had writing an article ever and I hope I won’t go to hell for laughing at these videos. The Niteroi store from Rio de Janeiro Brazil was celebrating its anniversary, and since Black Friday is just around the corner, they thought it would be a good idea to celebrate with huge discounts on many of their products (well, honestly, I think they just wanted a good fight!). The footage was shot on a mobile phone by one of the employees showing something that resembles a medieval battlefield. You can even see some of the customers punching others to get to a certain product first, as you can see in the pictures below. 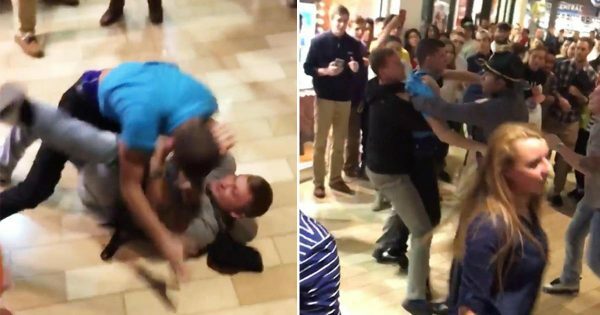 You know it’s a fight when you see dozens of people filming with their mobile phones and you hear shouting the famous (or infamous) words in the background: “WORLDSTAR, WORLDSTAR!”, because that is exactly what happened at Saints Matthews Mall in Louisiana. 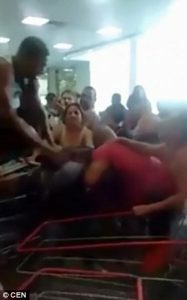 Multiple videos have surfaced on the internet showing two men fighting but it is not certain who or what started this brawl. The fight lasts about 30 seconds, when a police officer steps in and breaks the fight, separating the two men from what seemed to be a wrestling match now (and who doesn’t like a good *free* wrestling match?!) These animals fighting would be jealous! Everybody likes watching TV, especially if it is a huge flat screen high definition TV. Of course not all people can afford such expensive devices, but that is what Black Fridays are for (right?). Well no. 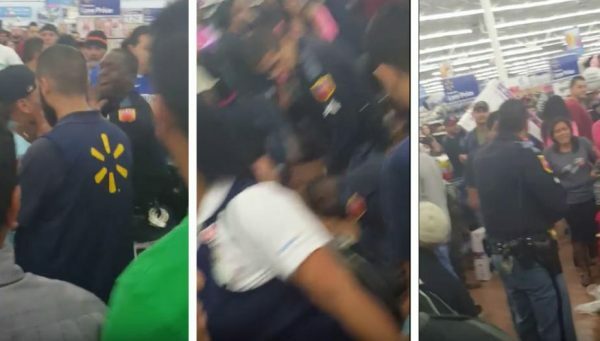 This Walmart in El Paso, Texas, had some big discounts on TVs and everybody rushed to get one… by all means necessary. As it is shown in the , the riot is centered around one TV (that special one of a kind, one could add) which leads to a police officer having to calm the situation – from what I read there was an off duty policeman who also helped. Now things really get out of hand, when one of the customers decides it is a good idea to hit one of the police officers. Now, I like TVs too, but with the police brutality that is going on in the US right now, hitting a cop is a very bad idea! 4.Who needs three veggie steamer!? How can you steal from a kid !? I do not even know where to begin with this one. In the first part of the video, you will see a bunch of people literally throwing themselves for some boxes in the middle of the store and you might think that it’s some limited edition iPhone, a fancy console for video games or a rare gadget! Turns out they are vegetable steamers (yeah, you read that right!). 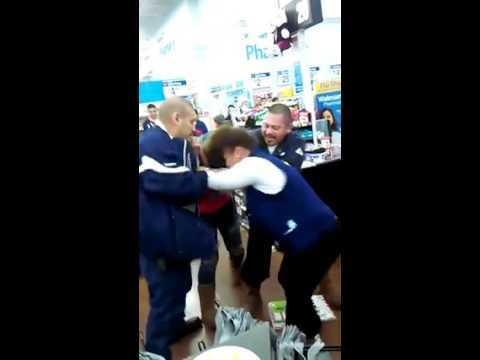 Besides what we can see in the video all I know about it is that it was filmed in a Walmart in Michigan. A few seconds later, you can see a woman and her child taking three of these boxes and another woman steals the box from the little kid, who in the hell steals from a little boy? Also, who needs three vegetable steamers? 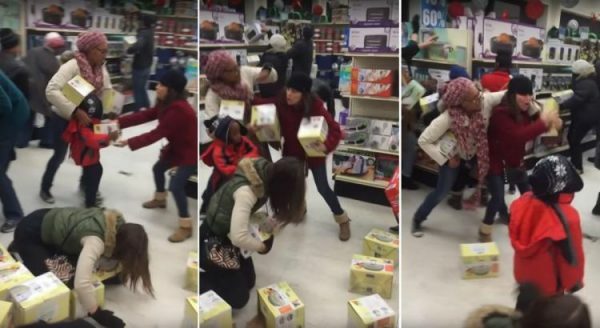 After that, the two women get into a fight over the box and the one who stole it acts like she did nothing wrong. After watching so many videos and reading crap stuff about the violence on Black Friday, all I have to say is either wait for Cyber Monday or just shop online!! !